The delightful Grand Design Transcend travel trailer was designed to provide you with an exceptional living experience wherever you are. This RV comes in a variety of floorplans that sleep where from 4 to 10 people. Learn more about what makes this a unique RV in our Grand Design Transcend travel trailer review. If cooking amazing meals is something that makes you happy then you will absolutely love this RV. It comes with everything you need to create delicious meals that tantalize the tastebuds, yet are healthy and made with the finest ingredients that you choose. At the end of the day you will absolutely love having a spacious, comfortable bedroom to cozy up in and rest. From the attractive decor to the ample storage, this bedroom promises to make you feel right at home. Wardrobes on either side of the bed are great for mom and dad’s clothing, while overhead storage provides the perfect place to keep extra pillows, blankets, and sheets. 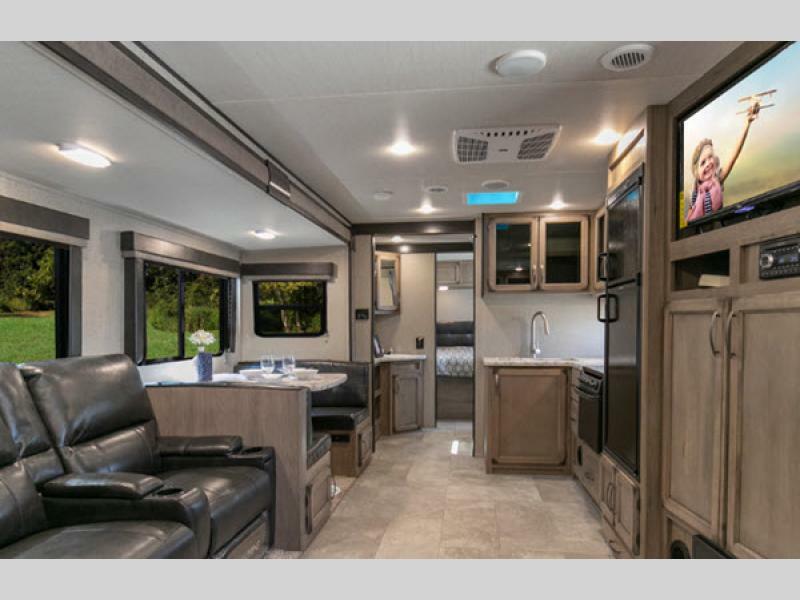 Whether you’re taking a nap or resting after a long day of fun, you will absolutely love the peace, quiet, and relaxation that comes with this RV. 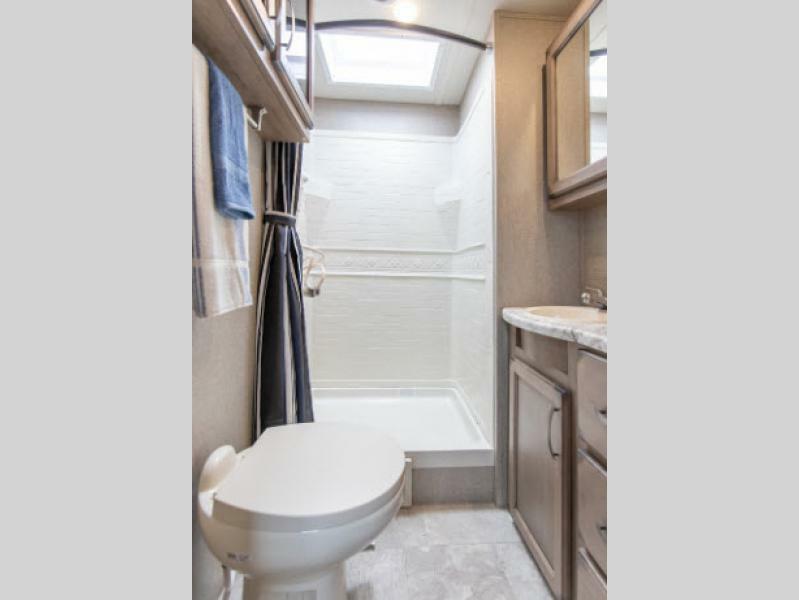 One of the most common questions we get from RVers is how large a unit’s bathroom is. You’re bound to be impressed that Transcend’s bathroom is huge. It features a walk-in shower, medicine cabinet with a mirror, and even ABS tub surround. Whether you’re getting ready for the day or winding down for the evening, this bathroom is a great place to get cleaned up and ready to go. 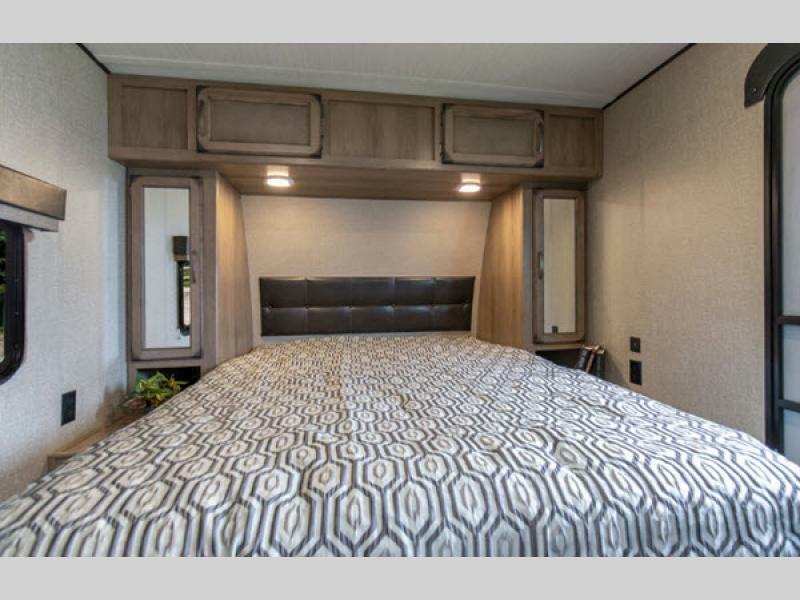 If you’re interested in learning more about our selection of Grand Design Transcend travel trailers for sale, contact us. We can answer any questions you have about these impressive travel trailers and ensure you have the information needed to make the best decision for your needs. We can also assist with RV financing.